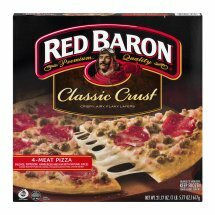 Red Baron® Classic Crust 4-Meat Pizza. Sausage, pepperoni, hamburger and ham with natural juices. Sausage made with pork and chicken. Pepperoni made with pork, chicken and beef. Made with 100% real® cheese. U.S. Inspected and passed by Department of Agriculture EST. 1999.